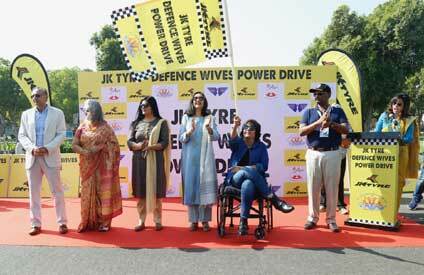 New Delhi: JK Tyre & Industries Ltd,India’s leading tyre manufacturer and pioneer of motorsports in India,successfully organized the first edition of ‘JK Tyre Defence Wives Power Drive’in National Capital today. The one-of-its-kind all-women rally aimsto celebrate the spirit of the Indian Armed Forces andpromote motorsport among women in India. Flagged-off from the ceremonial boulevard Rajpath, the rally witnessed participation of 115 women who were wives of Indian Armed Forces personnel who came together to race for the cause of women empowerment. Adding a unique dimension to the Rally, the challengers were encouraged by the serving officers who acted as navigators for the drivers throughout the TSD (time, speed, distance) rally. Padma Shri Deepa Mallik, Indian Para Athlete graced the ceremony and flagged-off the rally in presence of Mrs. Madhulika Rawat, President Army Wives Welfare Association(AWWA). Joining them was Mr. Vikram Malhotra, Marketing Director, JK Tyre & Industries Limited. The unique rally travelled through some of the iconic locations of the capital city, before culminating at Surajkund in Faridabad where the winners were felicitated. The JK Tyre Defence Wives Power Drive is yet another initiative by JK Tyre to showcase the increasing power and strength of women and also to salute the indomitable courage and bravery of our Defence Forces. 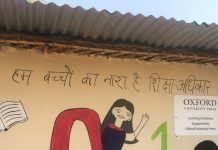 JK Motorsports has played a pivotal role in bringing women into motorsports and year on year have been adding newer and unique events focused on women in its calendar like the YLFO Power Drive, JK Tyre Times Women’s Drive, JK Tyre Women’s Rally to the Valley.